Hutchings Direct keep a wide selection of trade and professional hoses suitable for various purposes and environments. This category features reels for on-site and mobile work, which boast lightweight construction and portability features, plus coiled air hoses. For larger and more heavy-duty hoses suitable for more demanding professional and industrial-grade work, take a look at our professional and workshop air hoses. 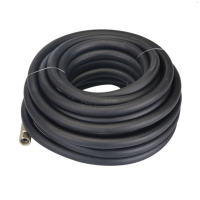 A High quality industrial reinforced rubber air hose with 8mm (5/16") ..
A high quality 10 metre reinforced 8mm (5/16") bore air line rubber ho..
A coiled air hose is a tangle-free and kink-resistant solution for num.. The SIP 3/8" 5m Professional Air Hose is manufactured from super heavy.. The SIP 25ft Coiled Air Hose is a tangle-free and kink-resistant solut.. The SIP 3/8" 25ft Workshop Air Hose is manufactured from super heavy-d.. The SIP 3/8" 10m Professional Air Hose is manufactured from super heav.. The SIP 3/8" 50ft Workshop Air Hose is manufactured from super heavy-d..
A 15 meter long, high quality reinforced 8mm (5/16") bore air line hos.. The SIP 3/8" 15m Professional Air Hose is manufactured from super heav.. The SIP 50ft Coiled Air Hose is a tangle-free and kink-resistant solut.. The SIP 3/8" 20m Professional Air Hose is manufactured from super heav..